SYDNEY US Secretary of State John Kerry on Monday warned Iraqi Prime Minister Nouri Al Maliki not to cause trouble as he threw his weight behind newly-elected President Fuad Masoum to help fight Islamic militants. 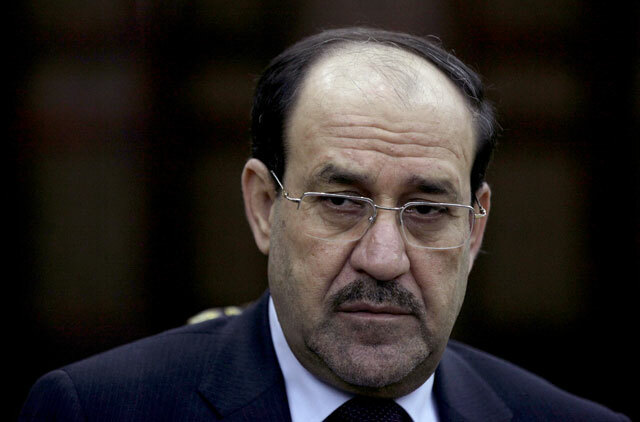 His comments came after Al Maliki announced Sunday on state television he would be filing a complaint against Masoum and as troops and police massed in the capital Baghdad. Masoum’s election on Thursday is another step towards forming a government which could see the embattled Al Maliki replaced as prime minister, even though his party won the largest bloc in April parliamentary elections. “We stand absolutely squarely behind President Masoum (who) has the responsibility for upholding the constitution of Iraq,” Kerry said in Sydney, where he will attend annual US-Australia military talks. Al Maliki, who has been under huge pressure to give up his bid for a third term in office, announced his plans to file a complaint to the federal court in a surprise address at 2100 GMT Sunday. He alleged that Masoum, a Kurdish politician, had twice violated the constitution, including by failing to task a prime minister-designate with forming a new government. Meanwhile, security sources Monday said Iraqi police, army and counter-terrorism forces were deployed in unusually large numbers across strategic locations in Baghdad overnight. Kerry urged calm and called for the constitutional process to be completed. “Among the Shiites it is very, very evident that they have three candidates or so for prime minister. None of them are Al Maliki,” he said. “So what we urge the people of Iraq to do is to be calm. “There should be no use of force, no introduction of troops or militias into this moment of democracy for Iraq. He added that Washington believed “the vast majority of the people of Iraq are united in an effort to be able to have this peaceful transition”. “We believe that the government formation process is critical in terms of sustaining the stability and calm in Iraq,” Kerry said. “Our hope is that Al Maliki will not stir those waters. Many Iraqis see Al Maliki as partly responsible for the recent conflict in northern Iraq, saying he institutionalised sectarianism. The June onslaught on areas north and west of Baghdad led by the Islamic State of Iraq and the Levant has brought Iraq to the brink of break-up, with the government struggling to assert any authority beyond its Shiite power base. Washington, Tehran, the Shiite religious leadership and much of Al Maliki’s own party have withdrawn their support from him, but he has dug his heels in.